White Gold: 18ct. and 9ct. What is the Difference? Why Rhodium Plate? In Australia, engagement rings and wedding rings are usually made in either 9ct. or 18ct. white gold. For an engagement ring, 18ct. is the standard and best metal alloy, rather than 9ct. gold. Usually the wedding ring is made in the same alloy as the engagement ring. This is so the metals look the same and they wear at the same rate. White gold is an alloy of gold and palladium. Gold is yellow in colour, so it must be mixed with another metal in order to achieve the white look we want. Palladium is a white metal – it is what gives white gold its colour. In some countries, nickel is used in the alloy. Due to the allergy that many have to nickel, we do not use this in our alloy. Some poor quality alloys produced overseas contain other white metals. These should be avoided. In 18ct. white gold, the mix is three parts gold to one part palladium, hence the stamp “750” in 18ct. gold jewellery. 9ct. white gold has half the gold content of 18ct., so jewellery made in 9ct. gold is stamped “375”. Palladium is quite a soft metal, so 9ct. white gold is (contrary to popular belief), less hard wearing than 18ct. gold. This is because it has much more palladium content than the 18ct. gold alloy. The colour of the gold and palladium alloy is not a brilliant white. In fact it has quite a dull, grey look to it, which is why we rhodium plate white gold to give it a whiter, shinier appearance. Before it is rhodium plated, 9ct. gold has a whiter, brighter look to it than the 18ct. alloy. This is because there is more palladium in the 9ct. alloy. Rhodium plating does wear away with time, so it is a good idea to bring your ring in to us every 18 months to two years so we can check all the settings and make sure the diamonds are all still secure. Daily wear and tear, knocks and bumps can all damage the ring and settings can become loose. Having the ring checked and re-polished is a good way to look after your jewellery. It will also bring your engagement ring up to looking like new again! What Metal Colour is Best? This is a difficult question to answer, as it really comes down to personal preference. 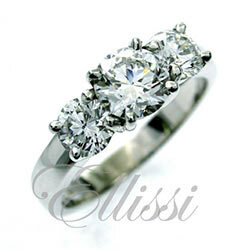 White gold is often used in engagement ring settings, as being white, no colour is reflected through the diamond. Platinum is also often used for this reason. If yellow gold or rose gold is used, the diamond reflects the yellow or pink colour. As we custom make all our rings, you can have the metal combination of your choice, so go with what you love! Pictured here are three solitaires. The bottom ring is in platinum, the middle ring in 18ct. white gold and the top ring is 18ct. rose gold. Undecided? This link will take you to all the engagement rings on our site, so you will see a mix of metals and different combinations we have made in the past. Enjoy! Please don’t hesitate to contact us if you have any questions or would like to book an appointment.